When the first YouTube Music Awards streams from global venues this Sunday, at least one car will be ready to immerse itself in the experience. Kia, which is sponsoring the event, has tricked out a 2014 Soul with enough tech to host an impromptu awards party pretty much anywhere the car can go. Sure, it's a promotional gimmick, but it's also a peek at what a streaming-capable car could look like. 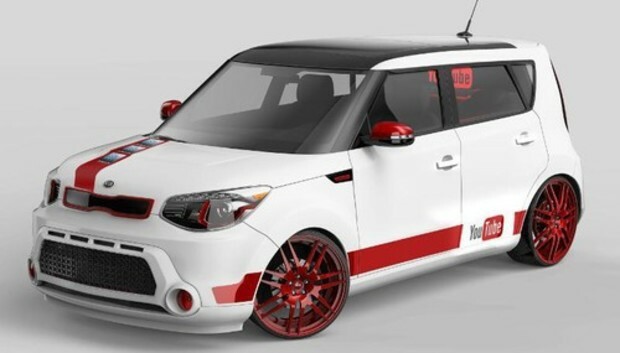 The customized Kia Soul is ready to make videos as well as stream them. A interior-mounted, high-definition webcam can record you and your hamster pals. A keyboard embedded into the rear center armrest makes Web surfing easier. In the back, there's a cargo holder for 10 iPad Minis, and a Mac-Mini-powered hotspot for anyone to connect inside the car--or all around it. Our video addiction is only growing. YouTube currently gains about ten million viewers per day. Upstarts Vine and Instagram serve up tasty video snacks that make us hungry for more. This streaming machine will feed the need--and likely lead to a whole new level of driver distraction. But at least we'll be all caught up on the latest kitten vids.